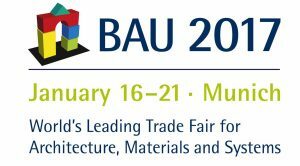 BAU 2017 is a must see for all professionals working in the world of architecture, materials and systems for industrial, commercial and residential building. To the event will participate more than 2000 exhibitors coming from all over the world, including architects, experts in materials and systems for industrial construction, builders and interior designers. In addition, the show provides some guiding themes defined in accordance with industry sectors represented at the event. These topics are discussed and proposed in different forms by most of the exhibitor companies, as well as in forums and special shows. Many are the events and forums offered during this edition. Every day will be examined current issues regarding smart construction materials, BIM and residential buildings. Do not miss the usual meeting with the series of debates “Architect and Industry in Dialogue” which will take place every day of the fair. Prestigious international speakers and will talk about new developments and trends. Fratelli Mariani, specialized in manufacturing expanded metal and wire mesh since 1929, will present to the public a unique and innovative product. Contact us to fix an appointment and receive a gadget.